Keeping track of what’s where in terms of your jewelry can be a challenge. Often one earring gets lost and renders the other one useless marking the end of that favorite pair. It is not a crisis but it can be very annoying. 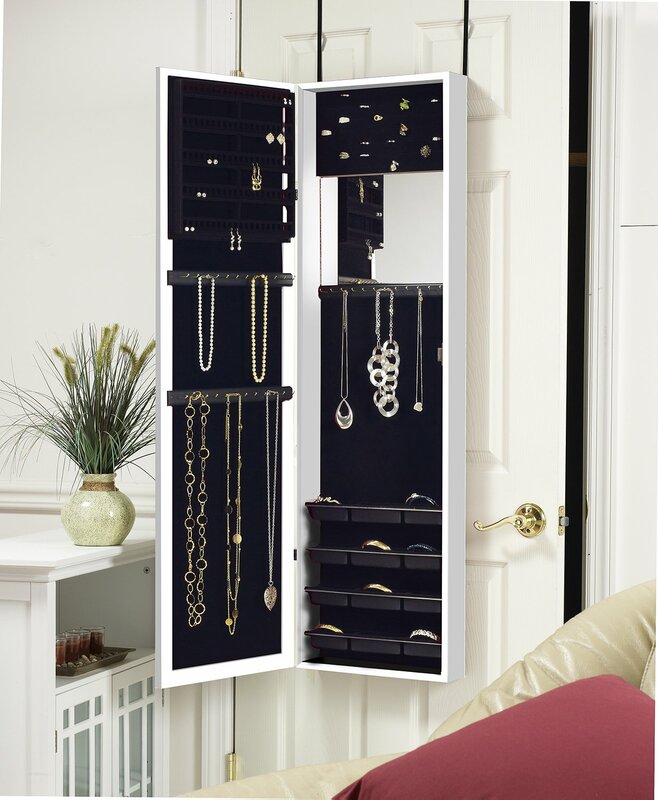 Jewel amoires are great units for jewelry storage as they enable you to organize your jewelry with ease. 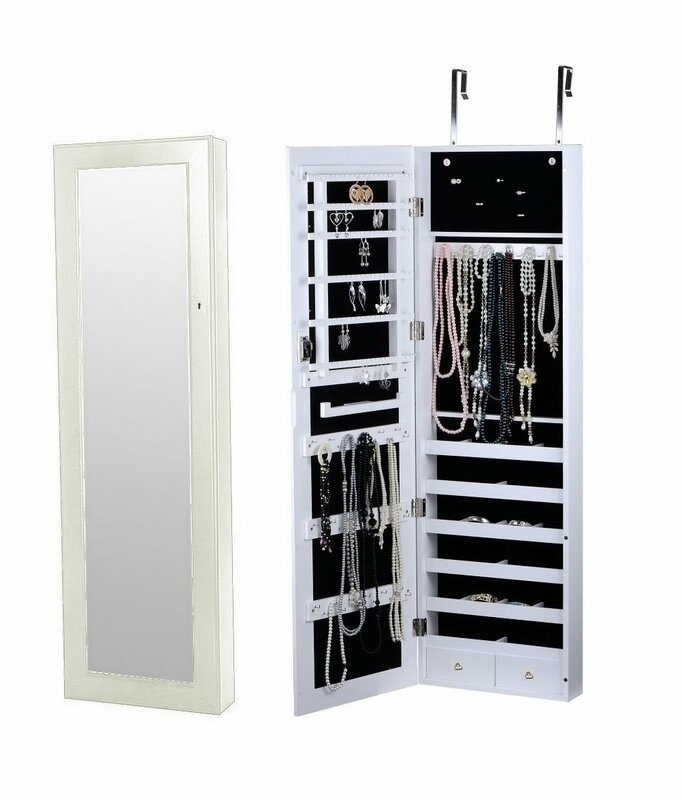 Considering door or wall mounted jewelry armoires occupy very little space they are very ideal for the bedroom and small apartments. They make use of under utilized space behind the door or wall: Thereby creating storage space where there was non. They don’t require additional space: And also don’t add to the clutter and congestion in your room. 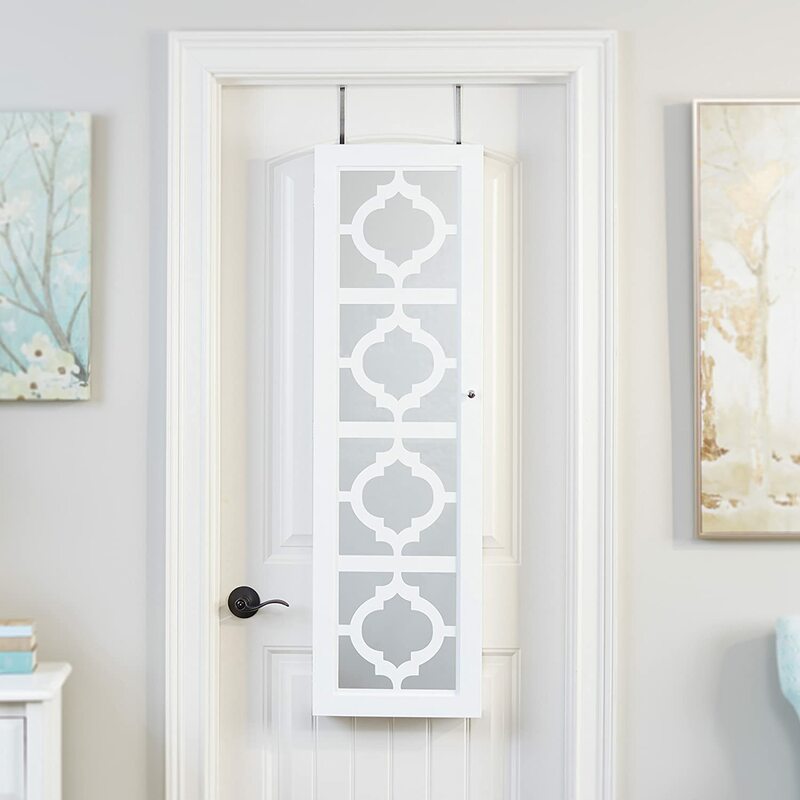 Perfect for tiny spaces: Door hanging and wall mounted jewelry armoires are the perfect storage solutions for small spaces in the bedroom or bathroom because of the above two reasons. Large capacity storage and neat organization for your jewelry: Your jewelry organized neatly and best of all, they can hold a lot of your precious jewelry. You always know where they are, which saves time. These armoires help to keep your jewelry safe and undamaged: Free from scratches and prevents them from getting entangled together. They are long lasting: So it will be years before you need a replacement. 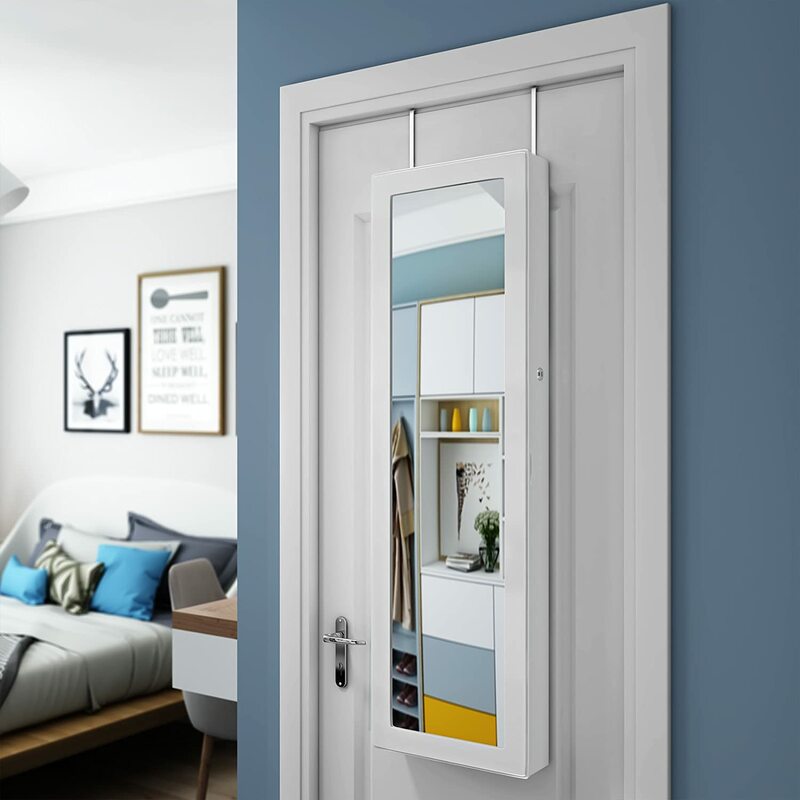 They come with additional functional features in addition to offering storage: These additional features include LED lighting, full locking feature with key for security and a full length mirror for convenience. Can be used as decorative pieces. That accentuate the overall look of your bedroom or bathroom. 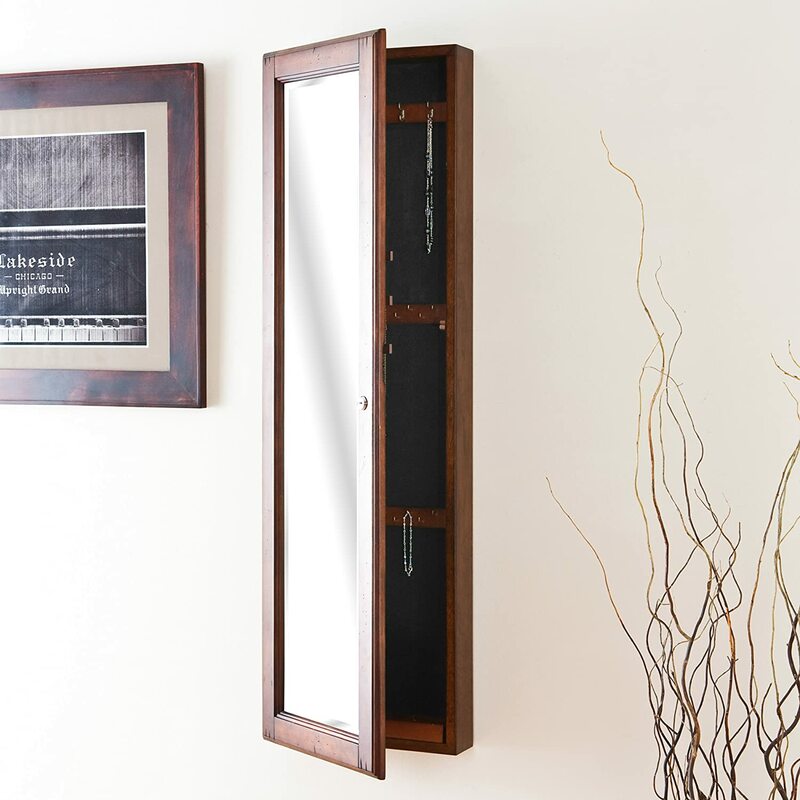 Below we review some of the best wall mounted jewelry armoires that score highly in practicality. Made from MDF, this cabinet is light weight and can be hang on the wall or back of a door. The exterior is white in color with lockable doors to ensure your precious pieces are locked away safely at all times. The interior is lined with soft velvet to prevent your jewelry from scratches. When you open the doors, the interior meets lights up with the help of 6 LED lights which are nice mood setter. More practically, you can see all the contents if working with a dim light in the room. You would need to buy 3 AAA batteries which are not included in the package. 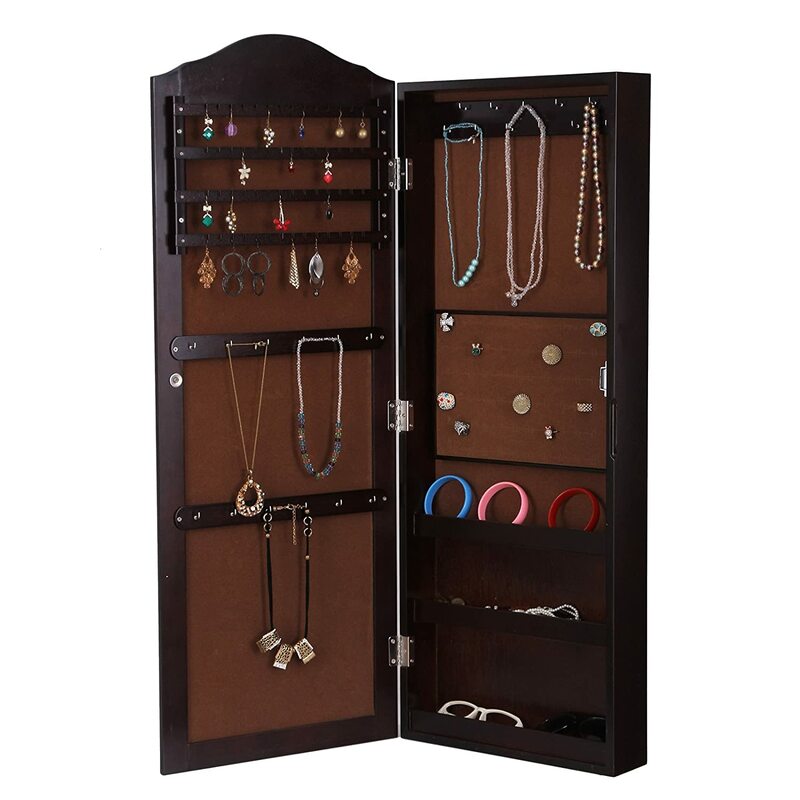 If you have tons if earrings, studs and necklaces this cabinet contains 48 stud earring holes, 90 earring slots and 32 necklace hooks as well as a bracelet rod. All your rings are secured in one place with a large ring cushion. It comes equipped two drawers and 5 shelves, offering additional ample space for all your other accessories. This is in addition to a full length mirror so you can examine how your accessories match your outfit without needing to look for a mirror. Most consumers loved the interior LED lights that make it easy to get dressed in the dark without disturbing your significant other. They rated the MDF construction highly as well because it made the cabinet easy to install. If you love the natural wood look and feel, you will love this door/wall mount unit made from plantation oak with a beveled full length mirror on the face. The inner felt lining for holding and protecting the jewelry is black except for the ring holder section that has a grey felt lining. This ring holder section comprises of 9 rows measuring 7.75″ each which ensure your rings never rub against each other and cause damage. All your necklaces can be accommodated by the five double hooks and additional 11 hooks that can take several necklaces each. Earrings are taken care of by three rows with 12 notches each. Each notch is capable of holding a pair of earring and your bracelets can slipped onto the bracelet rod. Other than the organization specs, consumers love the light weight of this armoire and the plantation oak finish that has natural wood flaws which add to the character of the unit. They rated the space offered by product highly because it ensured you do not run of a place for additional items. 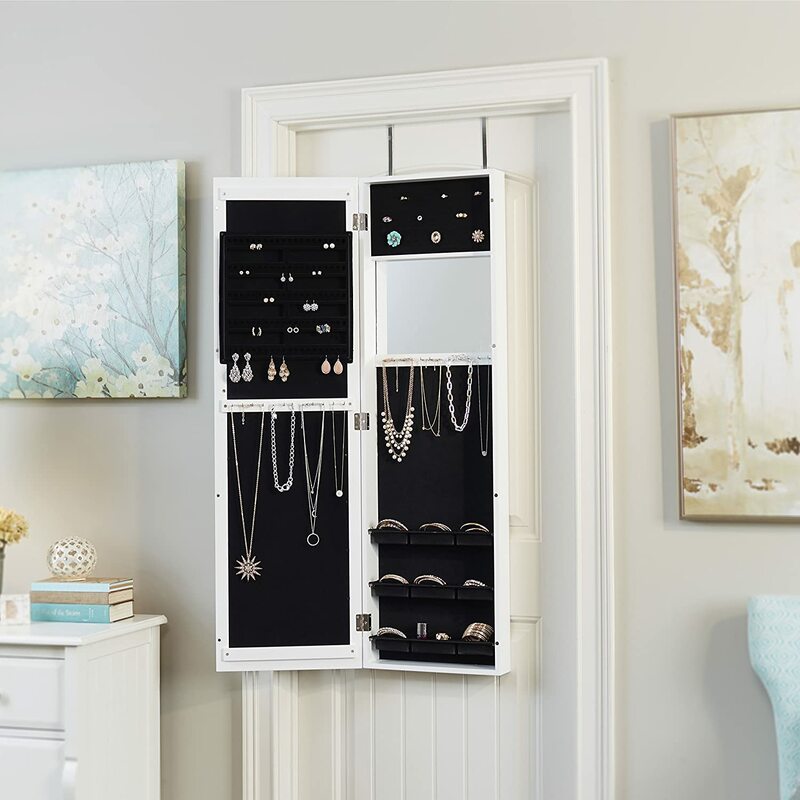 The Plaza Astoria Wall mount can fit all your jewelry in one spot and in organized order. 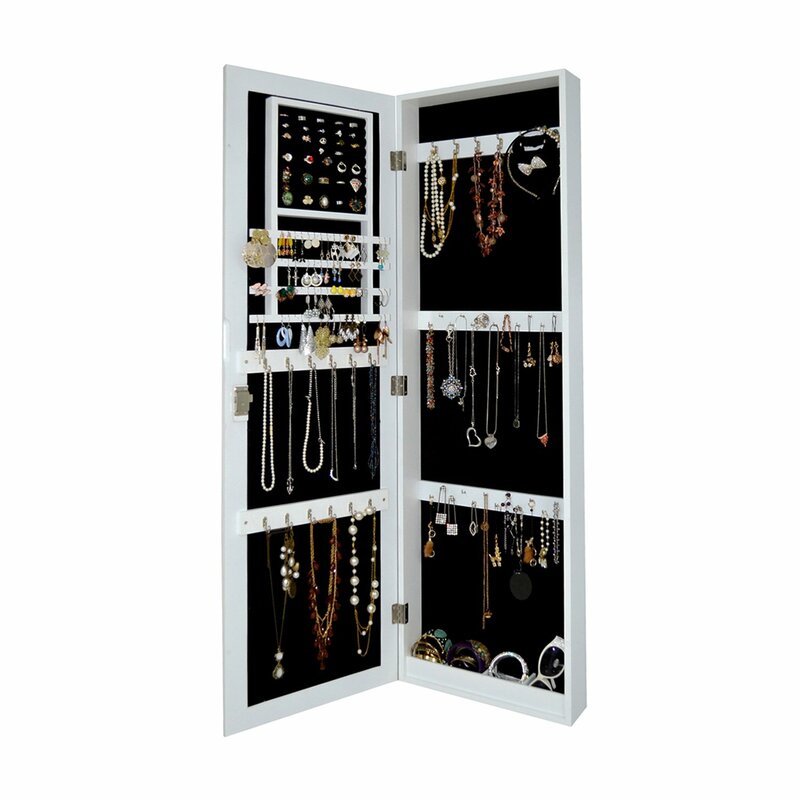 This unit has great capacity that can accommodates 48 earrings, 36 necklaces and can store 96 rings. The build is a slim profile with the option to chose from black, white, oak or cherry finish exterior that is fitted with a full length mirror. The interior is lined with black velvet to protect the jewelry. This unit can be hanged behind a door or mounted on a wall. The aesthetics are simple and merge with any décor. It comes with the right hardware to hang it up and installation is pretty easy. Consumers loved the configuration of the unit which keeps everything neatly in place. They rated it highly on its capacity and space saving ability even for a cramped apartment. 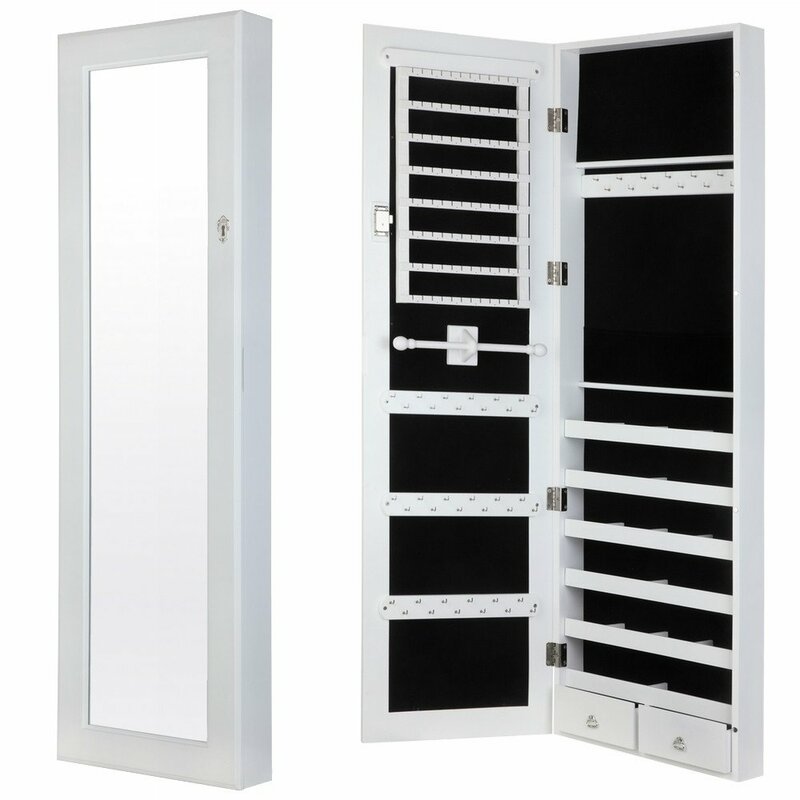 Available in black and white finish this armoire comes in black color both on the exterior as well as the interior. The inside is lined with black felt and the overall aesthetic is elegant. The exterior has a full length mirror and fully lockable doors ensuring your jewelry is kept of the reach of children or other parties. The unit comprises of 48 hooks for necklaces, earring holders that can take up 60 pairs of earrings and ring holders that store up to 80 rings. Additionally, it contains shelves that can be used for other accessories such as perfumes, watches and sunglasses. All your bracelets and scarves can go into a single bracelet rod while other valuables can be tacked away in the two drawers at the bottom of the unit. Consumer loved that it’s a perfect fit for any wall and it also hangs easy behind a door, saving loads of space. They rated it highly for the elegant and classic look it lends to the room. It looks more like a piece of furniture than an ordinary armoire. If your taste is more towards dark colors, this unit comes in chocolate brown but you can have it in white as well for a brighter color. The exterior has a full length mirror to facilitate dressing up in one spot. This unit is equipped with 10 LED light on the interior design that makes your accessories easy to find while adding a bit of charm. 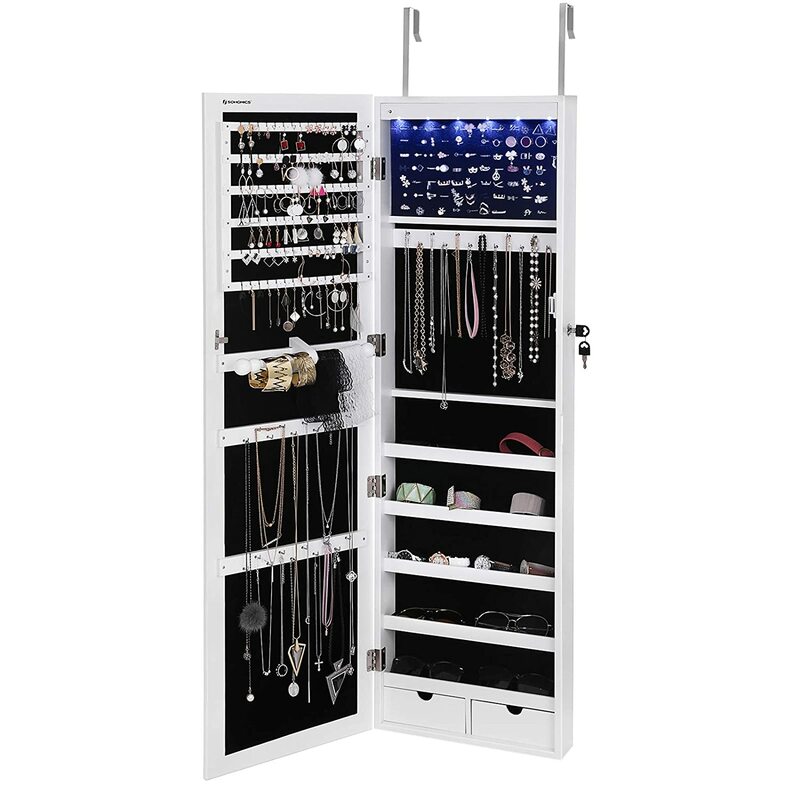 The unit provides you with 84 earring holes, 32 necklace hooks, 1 hanging rod and two drawers at the very bottom. Additionally it has 15 compartments on the shelves providing more space for other accessories such perfume bottle and watches just to name a few. Made from MDF, the unit is quite light and ideal for mounting on the wall or behind a door. It notably has three height adjustable hooks for door mounting. Customers love the carving on the exteriors top and bottom as it give the unit character and a unique look. They rated it highly on the convenience of the 10 LED lights when choosing your pieces. 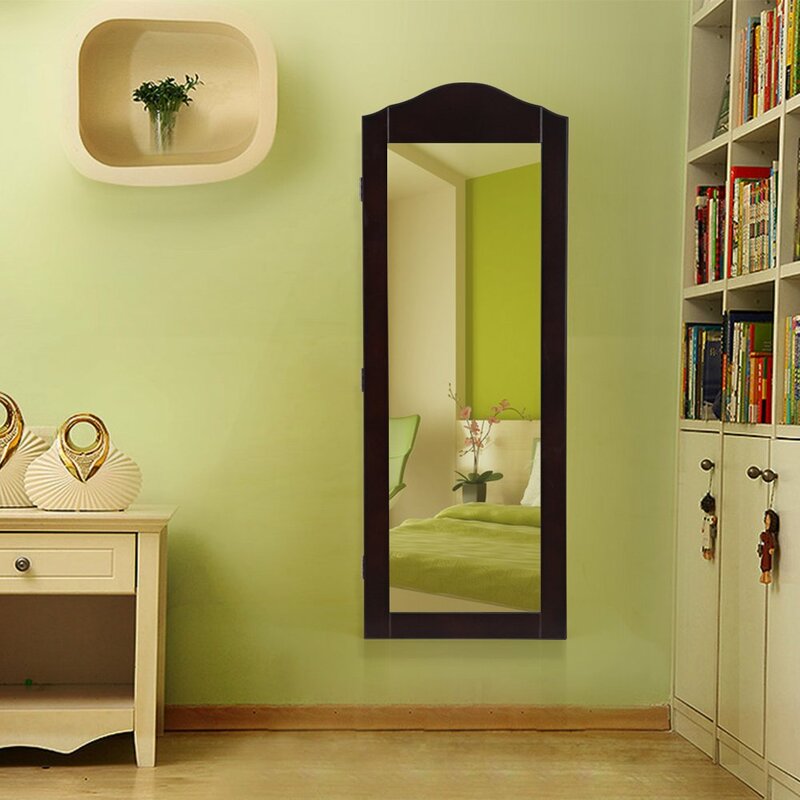 This unit has an MDF wooden frame and full frontal mirror. The doors are lockable ensuring your jewelry remains safe in one place. 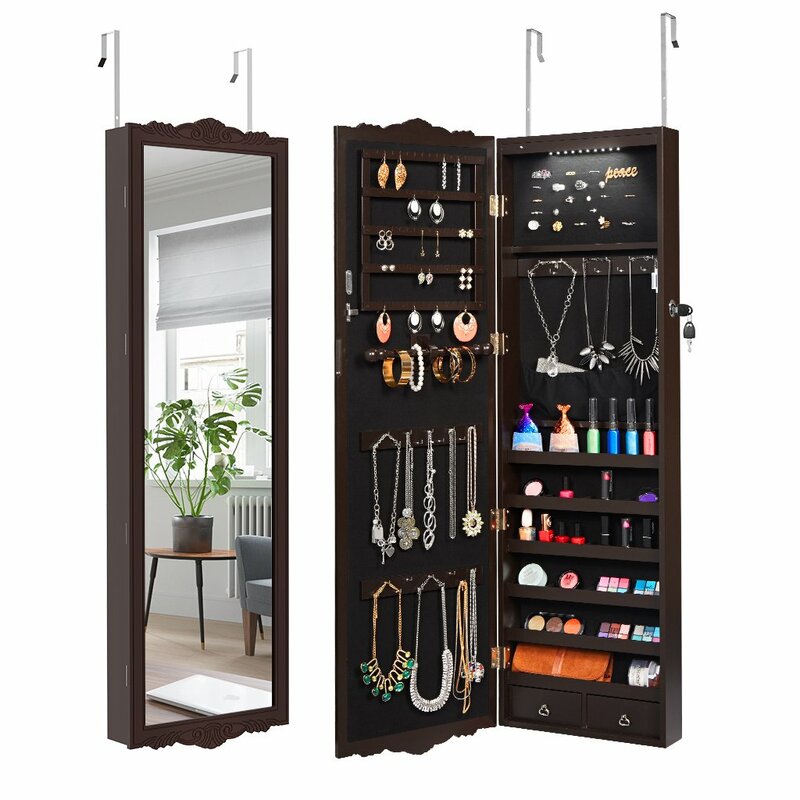 If organizing your jewelry is not one of your strength then this jewelry amoire is perfect for you as the configuration provides several rows to hold up to 98 rings and it can take an assortment of 140 hoop and clip earrings and your necklaces. The four shelves have a total of 16 compartments for perfumes, watches, bracelets, earrings as well scarves and such. In addition, it comes with a small pouch that can hold money or other valuables as well as two drawers at the bottom. It is designed to make organizing easy and effortless and most customers concur with fact. Customers love the practical configuration of the interior that gives you plenty of space. They rated it highly the compartmentalization and capacity to hold a lot of jewelry. If you are looking for an Eco- friendly jewelry armoire this is the top pick in that regard. The interior felt is bio-degrade able and no lacquer has been used anywhere on the unit. Additionally, glass glue has been used for the joinery of the mirror. All this meticulous attention to eco-friendly detail in the construction does not compromise on utility or aesthetics. Quite the contrary as the unit has a frameless mirror on the face of the exterior whose door is lockable. The interior is designed with easy slots that allow easy placement and removal of earrings, necklaces and bracelets. It can accommodate earrings, bracelets, scarves, make up kits, sun glasses, watches and perfumes. Top 1 wood of P2 standard is used making it a light unit that can hang behind a door or be mounted on the wall. Customers love the eco-friendly aspect. They rated it highly on excellent aesthetics and unique build. 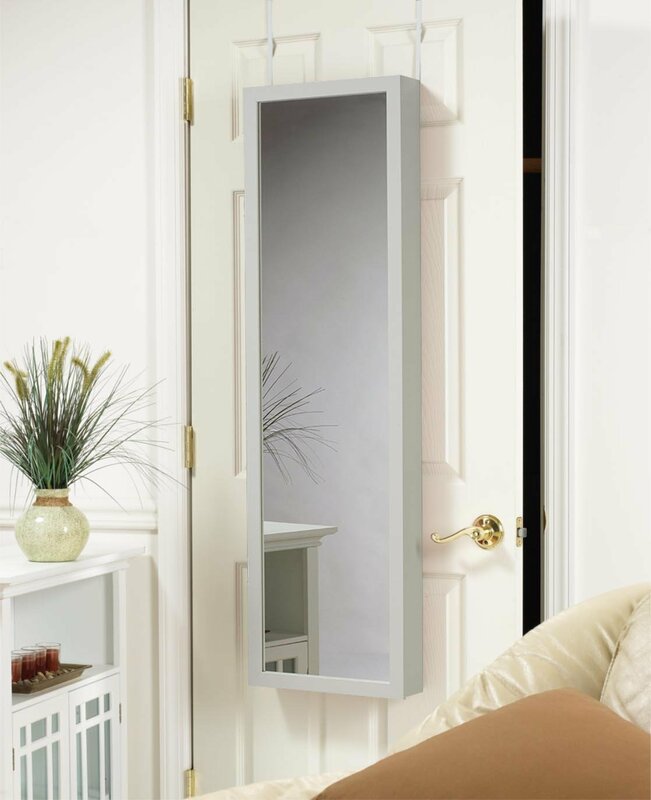 Unlike other armoire on this lost that feature a full length exterior mirror, this affordable armoire features an interior full face mirror. 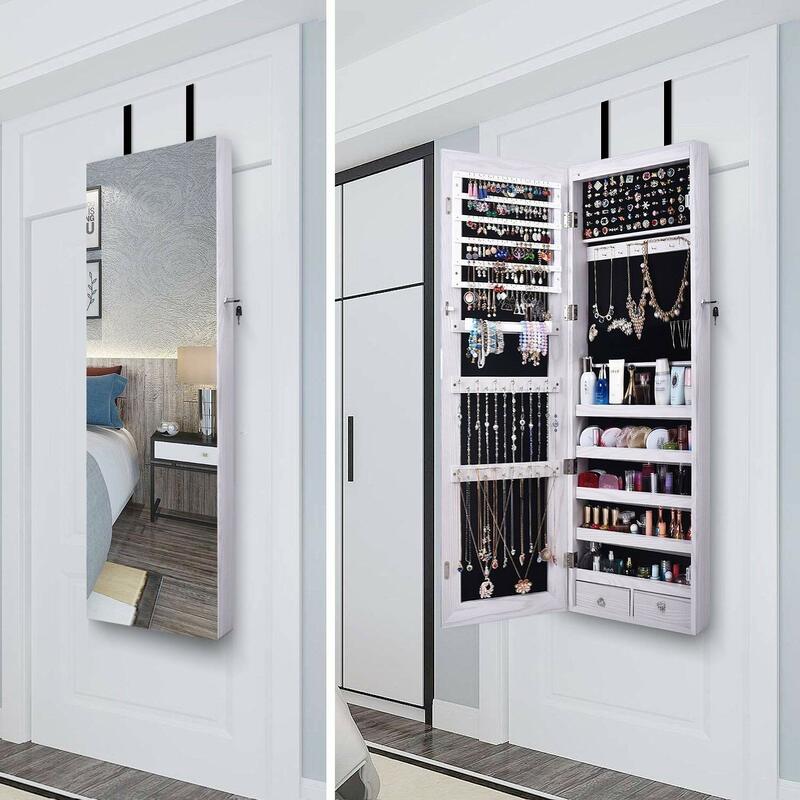 It is a decorative piece in addition to being a jewelry storage organizer and comes equipped with a magnetized door clasp for fast and easy installing. The interior is lined with 100% quality black felt for holding and protecting jewelry from scratches. The storage configuration includes compression folds for up to 84 dangling and studded earrings as well 24 hooks for necklaces. The unit can easily hang at the back of a door or can be mounted on a wall. Many customers liked the pricing and the color diversity of this unit. You can choose from 11 colors ranging from white, walnut, ash, cherry, oak and espresso just to name a few. This jewelry armoire is brown colored and made from MDF with a curve design at the top. The door has magnetic a clasp and it has a full mirror attached on the door. The configuration inside is fairly simple but offers good capacity comprising of 23 hooks for necklaces, 56 notches for earrings as well 66 ring slots. It packs an additional three shelves for bracelets, watches, perfumes and other accessories. Customers who bought this loved the simplicity and practicality of this unit, not to mention the friendly price. They rated it highly on ease of assembly and the light weight construction. 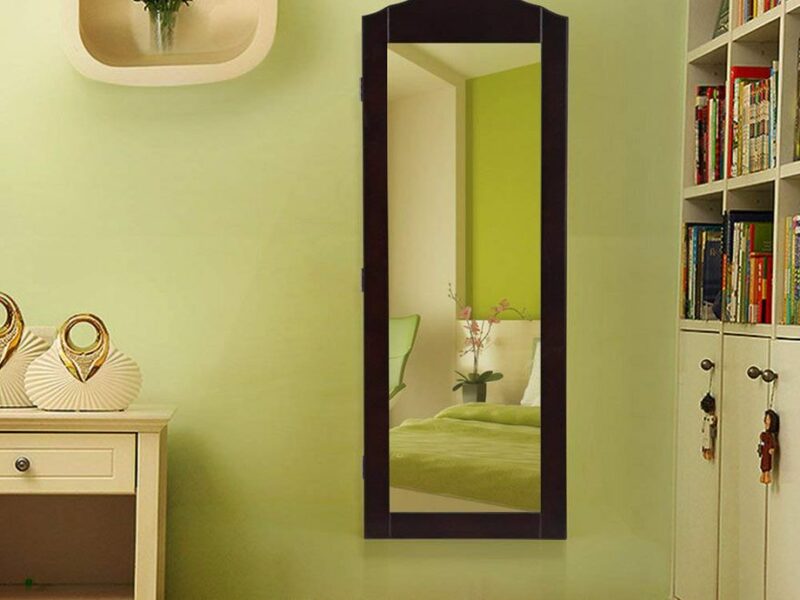 The slim profile of this unit comes with a full length mirror on the face of the exterior. The door is also lockable helping you secure your treasure trove. The interior is lined with felt and white wood framing. It is configured in a practical but stylish way with the ability to hold 91 rings and 42 necklace on the proffered hooks. It has 4 rows of earring holders that can hold up to a total of 36 earring pairs and 24 holes are provided for earring studs. Watches, perfumes , scarves, sunglasses and other accessories can also be neatly tucked away in the provided shelving. Customers particularly loved the large ring capacity. They rated it highly on a very organized and well configured interior with plenty of storage options for pieces. Jewelry is a woman’s treasure. All the above mentioned jewelry armoires present an array of styles and jewelry organizing configurations that help you easily find your jewelry pieces. Best of all, they come with wall mounting or door hanging hardware and require little to no assembly. The different price ranges also provide you with the flexibility to select just the right fit to suit your style, needs and budget.